The temperature has dropped, the evenings are darkening, brisk breezes sweep the trees and knock my giraffe-like vine tomato Jeremy to the ground: it’s only just August but it feels like the best of summer is over and autumn has set in. Every day when I walk through the front garden another of our beautiful rose buds has opened and been immediately vanquished into a whimsical heap of sodden petals on the path. Still, interesting things continue to happen in the garden. 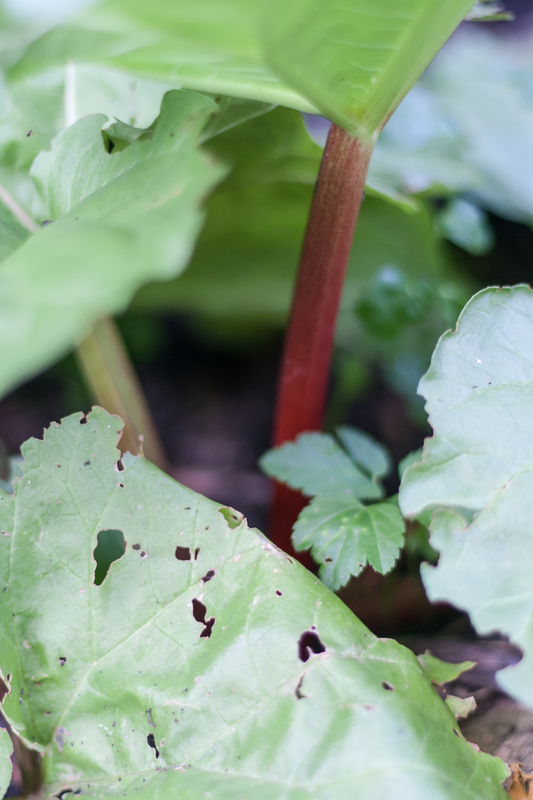 The rhubarb continues to produce, from which I have just made a delicious batch of rhubarb and ginger jam. Jeremy is now about six-foot tall and has an abundance of admittedly small, green tomatoes. (‘You should snip the top off,’ advised Right-but-one Neighbour. I Googled whether she was right and came across a variety of opinions. The decision was made for me when the aforementioned autumnal breeze knocked Jeremy over and snapped the top off in the process.) Kate has also produced an abundance of green tomatoes. 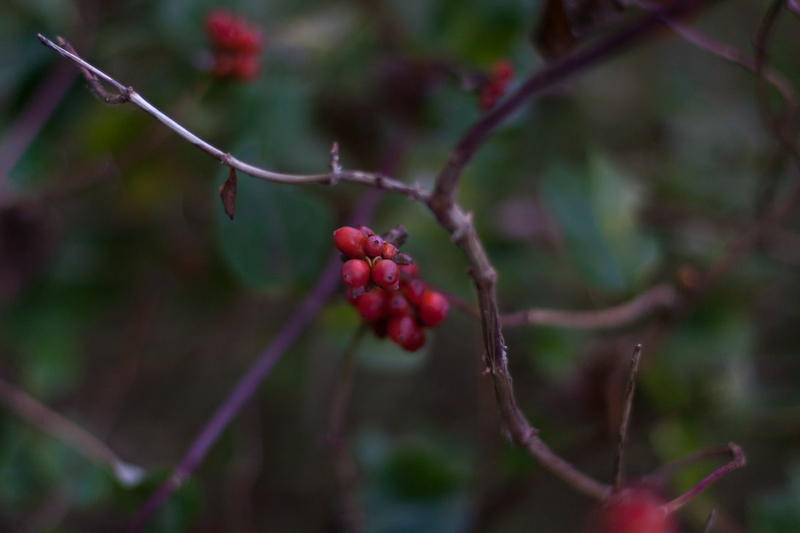 Our beautiful, beautiful honeysuckle has transformed into a Christmassy tangle of berries and twisted wood. 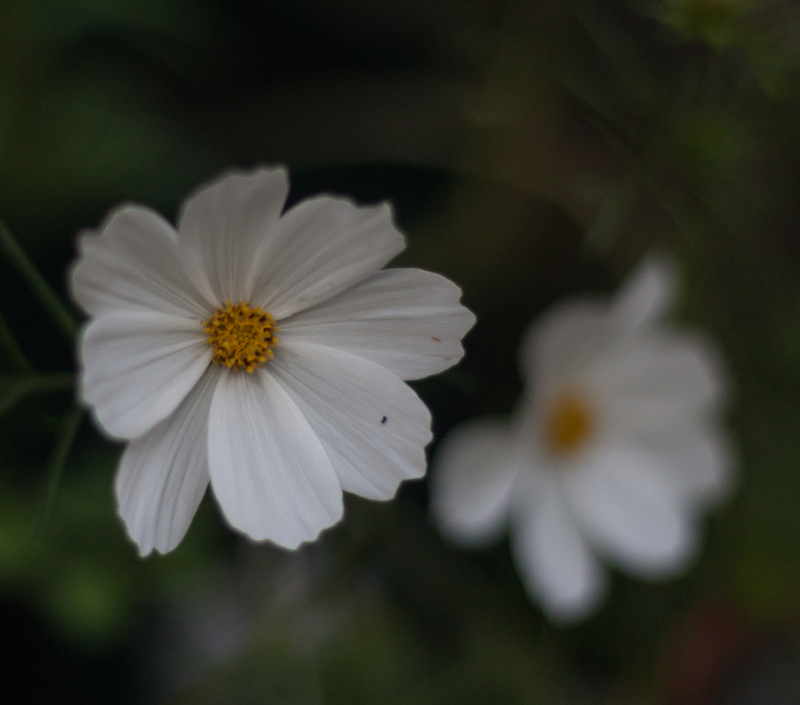 The cosmos, which I grew from seed, has defied all slug attacks and continues to produce flower after flower. And the spiky, orange-flowered Crocosmia* is flowering valiantly, although I suspect it would be happier in the ground rather than in a pot. 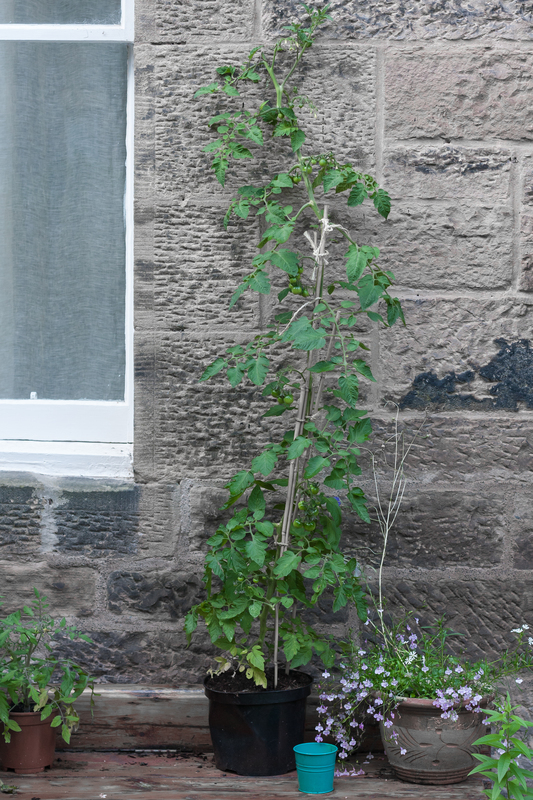 *There are five things that every single garden in Edinburgh, including ours, has: a rhododendron, a clematis, a crocosmia, a hydrangea (any colour), and a tall thing with yellow flowers on stalks (see below). You do get a short summer! 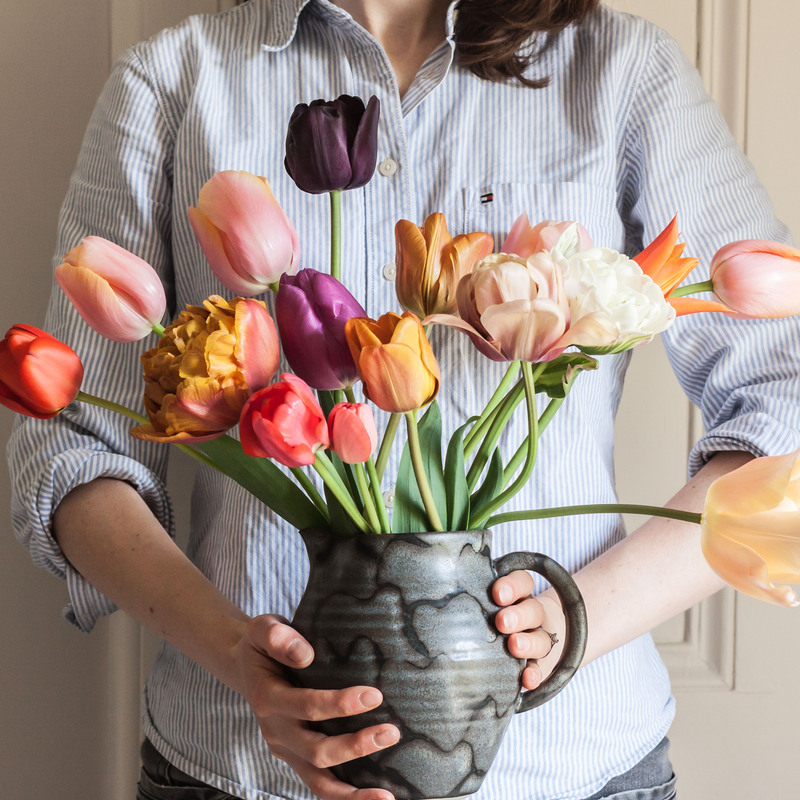 Time to start planning for a dazzling planting of spring bulbs? Your neighbour was quite right about Jeremy – he needs all the help he can get to fill out and ripen the fruit already on him; if he hadn’t fallen over you should have pinched out the topmost growing point and removed any bunches of fruit that are unlikely to ripen. This gives the rest a better chance. Unless you mean to make gallons of green tomato chutney, that is. The same applies to Kate, except maybe she hasn’t any leading shoot. 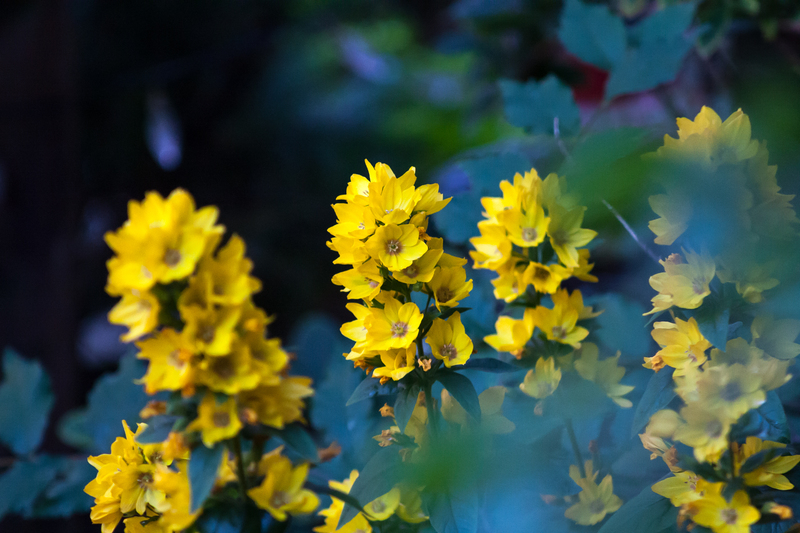 Your yellow flower is Lysimachia, apparently called Dotted Loosestrife in English. By coincidence my own neighbour gave me a large crate of it at the start of the season. 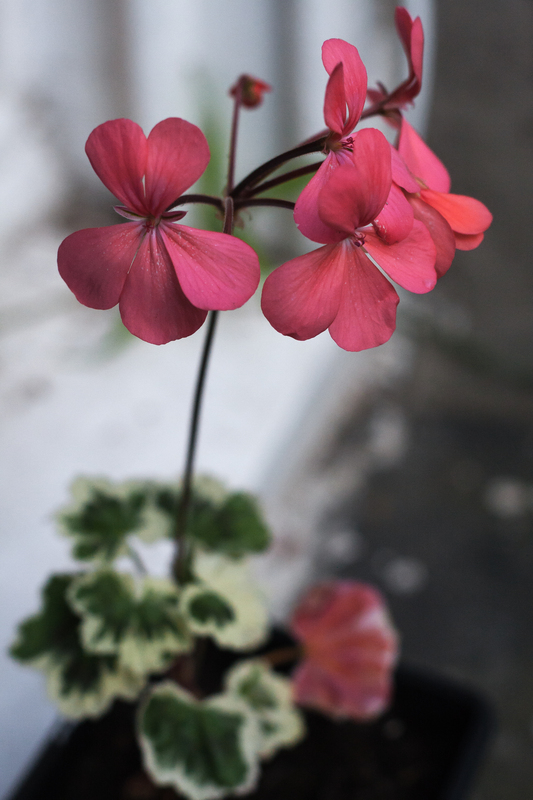 I was a little wary of it – the fact that they had so much hinted that it might be something of a runner so I planted it in tight corner which I hope it won’t be able to rampage out of. So far, so good. Thanks – I kept meaning to ask you. There are some smaller trusses of tiny green tomatoes that I’ll take off then, as many of the larger trusses look much more promising. Some of Kate’s tomatoes have ripened to red this weekend, yet there are still yellow flowers at the top of the plant that will probably not make it in time. There is a leading shoot on Kate so I’ll take that off too. My grandfather, who grew his tomatoes in a greenhouse, used to pick them when nearly ripe and finish them off on a south-facing window-sill. I am not sure what advantage there is flavour-wise, but it saves them from dropping off the plant, which is annoying, and is probably a good idea at the end of the season when sunshine is in short supply. Crocosmia, or montbretia as we used to call it, is an endearing plant. I can’t think why. As you say, it is spiky, also orange, which can be nasty on other flowers. When I was quite small we used to stay in a seaside house in Dorset which had two sorts of plants in its large garden – montbretia and fuchsia. Nowadays I should find the combination a strain, aesthetically, but then it was part of the wonder of seaside holidays (we had neither flower at home). I especially liked the fuchsias because you could pop open the fat pink buds and find the little purple underskirt all ready inside. 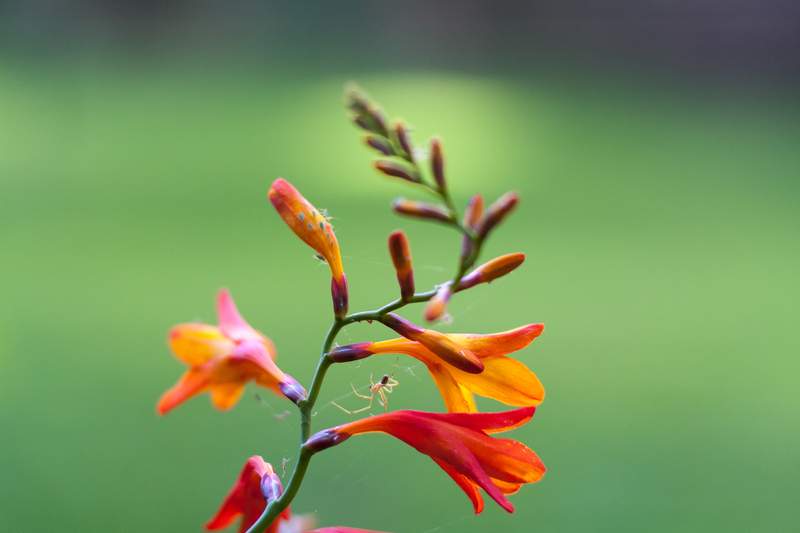 There are yellow and red sorts of crocosmia, but I cannot get excited about them, just the orange ones. I quite like the red crocosmias – haven’t seen any yellow ones yet but I am rarely delighted to see yellow flowers. Fuschias are odd things aren’t they. I thought they were the very last thing in elegance when I was about eight. Now I think of them as the floral equivalent of red Victorian tasselled lampshades.